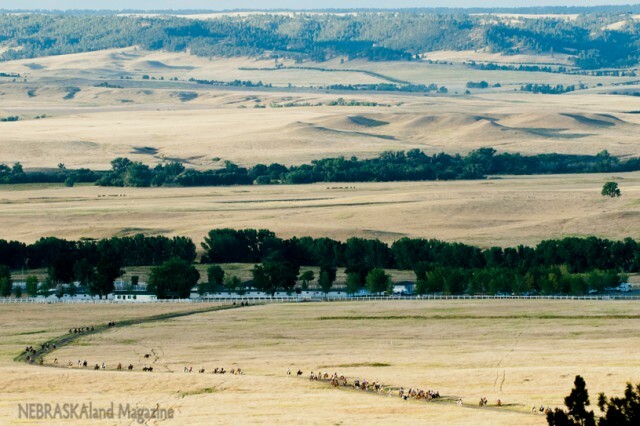 Those looking to ride horses in a scenic area with wide open spaces will be hard-pressed to find better territory than the Panhandle of western Nebraska. Two state parks in Nebraska’s scenic Pine Ridge offer trail rides and riding is allowed on an abundance of other public land in this region of rugged buttes, sweeping grasslands and ponderosa pine forests. With Fort Robinson’s expansive 22,000 acres, horsemen and horsewomen of all skill levels revel in a landscape fit for a Western movie. Deb Kennedy, assistant park superintendent, said the park offers something for riders of various skills. Kennedy said horseback riding continues to gain popularity at Fort Robinson, where weekly rodeos entertain visitors. Annual gatherings of horse enthusiasts, such as the American Paint Horse Association, have bolstered the park’s reputation as first-rate riding ground. No special permission is required to ride at Fort Robinson, but a few rules have been established. To ensure park safety and cleanliness, no riding is allowed near lodging or camping areas. Private horses also aren’t allowed on the two trail ride routes while park rides are in session. Overnight guests with horses must rent a stall, but the barn’s location near the campground and other lodging ensures that animals will be nearby. Chadron State Park, a 36-mile drive to the east, also is known for its scenic views from horseback. While the park doesn’t allow visitors to bring their horses, it does have a stable full of trail horses for rent. At both Fort Robinson and Chadron, wranglers lead trail rides with the parks’ horses from early morning through mid-afternoon. Another attractive park in the Panhandle butte country that allows horseback riding is the Wildcat Hills State Recreation Area south of Gering. Farther east in Oregon Trail country is Ash Hollow State Historical Park near Lewellen, where riding is allowed on the park’s property west of U.S. Highway 26. Neither park has horses for rent, but people may bring their own. Riders are sure to enjoy the area’s diverse wildlife. Riders in the parks farthest north and west may see bighorn sheep, especially when riding the picturesque Cheyenne and Red Cloud buttes at Fort Robinson. While some of the other park areas don’t allow horses, the dozen-plus Wildlife Management Areas in the region do. The established purpose of the WMAs is to serve as wildlife habitat, so no designated trails have been established. Organized group rides are prohibited but casual riders are welcome. Because hunting is encouraged on the WMA properties, hunters have the opportunity to follow traditions of pursuing game by horseback that were set by Native Americans, Cavalry soldiers of Fort Robinson and European settlers generations ago. If the Nebraska Game and Parks properties aren’t enough, public lands managed by other agencies, such as the U.S. Forest Service in the northern Panhandle and Platte River Basin Environments to the south, make riders’ opportunities seemingly limitless. So, saddle up for your western Nebraska adventure. Your ride awaits.